The Office Star Space Professional Air Grid Back Managers Chair is the best mesh office chair. It is designed to offer the occupant comfort, firmness and durability. It has easy height adjustments, armrests, a meshed back and stable wheeled stand that enable easy rolling to nearby workstations. It is black in color making it blend well with most office interior designs. The back is made medium to perfectly match the curvature of the user’s back and offer lumbar support required for long sitting hours. It is very easy to adjust the Office Star Space Professional Air Grid Back Managers Chair height. It only requires a one touch on the height adjustment arm located just below the left leg. It doesn’t get hot and stick the way most leather seats do. The 2-to -1 synchro tilt control feature allow the user to manage the side tilts and maintain balance. Its wheels surface is comparably larger making roll easily and present less destruction to the carpet. This good performance of the seat is brought about by the chairs special features which include; use of eco leather with mesh siding, height adjustment and height adjustable angled arms with soft PU pads and the tilt adjustments. The choice to use leather to fabricate the office space professional air grid back manager’s chair, grants it comfort and durability. Despite the fact that leather offers the users comfort, it has a reputation of getting hot when continuously used for long hours. This design does not present that challenge because its side is meshed making the leather have adequate circulation of air. Circulation of air in leather enhances its comfort making the user have ability to sit for long hours without straining. The Office Star Space Professional Air Grid Back Managers Chair with Eco Leather Seat presents easy height adjustments. The height of the chair can be easily adjusted using an arm below the left side of the seat. Its pneumatic height adjustment makes it capable to accommodate heavy occupants. Its arm rest is angled and adjustable. It makes making the users have the ability to select their desired height. The soft PU pad provides comfort when the arms are placed on the chair. The office space professional air grid back managers chair is equipped with the 2-to-1 synchro tilt control with adjustable tilt tension which allows the easy setting up. Despite the fact that a sit is comfortable the lack of proper posture can contribute to fatigue after few hours of seating. The adjustable tilt tension makes sitting fun since the seat can be made firm in one direction or allow less tense swings around. This features makes the office space professional air grid back managers chair a perfect seat to use when very busy and during short relaxation moments before switching tasks. Five wheeled legs making it stable and easy to role in any direction. Heath adjustable angled armrests having a sot PU pads. Durable leather with mesh sidings that allow breathability and comfort. 2-to-1 sycro tilt control with adjustable tilt tension. The office space professional air grid back managers chair cannot be adjusted forward. Despite that, the middle back allows the user to be upright while working and sink back to relax. For the tall users, this is the best option because it will provide the perfect posture for both resting and working. The arms are angled and thin and make some customers find it uncomfortable as compared to wide leather arms. It allows the user rest their arms for moderate durations because majority of people who spent long hours seated have their hands involved most of the time. This design offers the perfect reminder to get you back working. 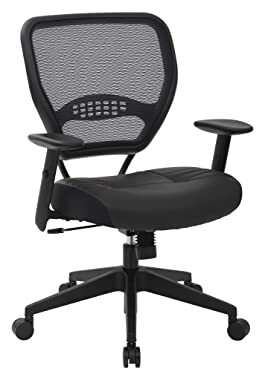 Customer﻿ Reviews on Amazon.com for ﻿Office﻿ Star Space Professional Air Grid Managers Chair.